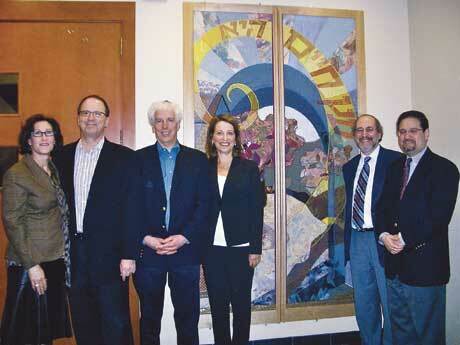 An intricate and unique set of Torah ark coverings found a new home last month at Temple Sinai in Tenafly. The 8-foot-high “parochet” was commissioned in 2001 by longtime Bergenfield resident Max Klingenstein for the Bergenfield-Dumont Jewish Center-Cong. Beth Israel in memory of his wife, Ruth. Canadian textile artist Temma Gentles based her “ghost layer” mixed-fabric appliquÃ© design on Ruth Klingenstein’s oil painting of a New England landscape. Max Klingenstein died in 2005, and when Cong. Beth Israel was absorbed into Cong. Beth Sholom of Teaneck two years later, the Klingensteins’ children sought a new home for the tapestries. Eisler’s son, Andrew, introduced her to Rabbi Jordan Millstein of Temple Sinai, who expressed an interest in acquiring the parochet. Synagogue President Michelle Harris came to see them at the Eisler home and enthusiastically agreed. Eisler explained that her parents had been active members of Cong. Beth Israel from the start. Ruth Klingenstein had survived World War II hidden in a Strassbourg convent, while Max Klingenstein had escaped the Nazis and fled to Manhattan’s Washington Heights neighborhood with his family. The two met after the war and settled in Bergenfield. Gentles added a yellow spiral running through the scene, which “represents God and makes the stunning landscape of hills and valley come alive,” said Eisler. The parochet was dedicated following services on April 23. Eisler and her husband, Neil, attended along with her brother, Jeffrey Klingenstein of Manhattan, and his wife, Maggie. Also in attendance was Rabbi Lawrence Troster, former religious leader of Cong. Beth Israel. A native Canadian, it was Troster who had recommended Gentles to Max Klingenstein. “The artist put a lot of my mother’s art into her artwork,” said Eisler, who belongs to Temple Emanu-El in Closter.